If your dog has ever been sick or in pain, you have likely felt at least a moment’s panic as you rushed to the web or called friends in order to figure out what ails it. 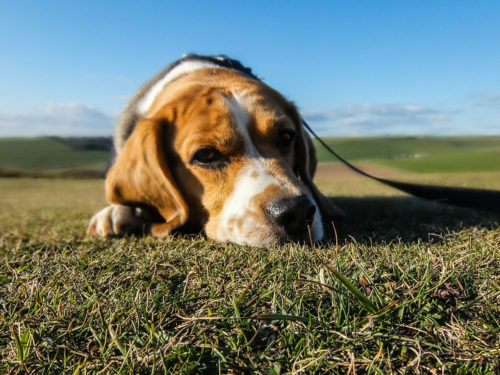 Since they cannot talk, dogs will let the observant owner know that something is wrong in other ways; they might whine, have low energy, low appetite or shallow breathing, which are all signs of pain in dogs. A fairly common medical issue with dogs is stomach swelling and painful abdomen. Now, sometimes this may occur from something as simple as overeating, however, these signs could also indicate something more sinister or life-threatening. Because of this, it is important that you speak to a medical professional or take them to the vet as soon as possible, rather than self-diagnosing. In the case of abdominal pain, there could be a danger of maladies such as blockade, tumor or organ disease. A small bill is much better than a sick or dying pup. That said, you should know what abdominal pain is, what it looks like and how it can be treated. 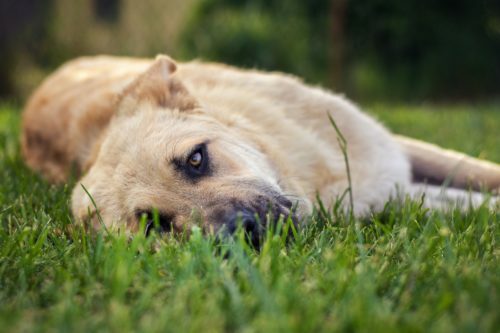 What is Abdominal Pain in Dogs? Painful abdomen in dogs can be caused by a variety of disorders. Repeated episodes of discomfort in a dog’s stomach are medically referred to as acute abdomen. Acute abdominal pain often times implies an underlying condition that must be treated in order to relieve your dog of its stomach pain. It is generally delineated into two types of acute abdomen: infectious or noninfectious. Infectious also referred to as transmissible or communicable disease results from infection. Within these groupings, there are various types of abdominal pain: Digestive, Metabolic, Musculoskeletal, Peritoneal Cavity, Reproductive and Urinary. What dog pain symptoms has your dog been displaying? What abnormal behavior signs have manifested? What is their diet? How often do they eat? How much? Did you add something different or a to supplement the diet? Has your dog been home or gone other places? Did you go somewhere new? Could your dog have been exposed to toxins or chemicals? Has your dog experienced any recent injuries? Has your dog undergone any recent trauma? After this, the vet may decide to test your dog’s blood, blood count, and urine. They will physically examine the dog, looking for evidence of trauma such as bruising or blood, listening to the lungs, listening to the heart, checking the gait, and examining the abdomen. If necessary, the vet may take a radiograph, fluoroscopy, x-ray and cytology test in order to further diagnose any potential causes. During this entire phase, your dog will be medically observed and in safe hands. If your dog’s condition gets worse, then they will take all the necessary steps to ensure its good health. Treatment is entirely dependent on the root instigator of abdominal pain. If a surgery is not required, the dog will be given fluids and administered medication to either treat the causes or to alleviate the painful symptoms. Antibiotics may be given as well in the case of infectious diseases. If they diagnose the cause as a disease, treatment will be contingent according to whatever may be required. A healthy or specific diet may also be added to supplement your dog’s recovery. In the cases where surgery may be necessary, expect a longer recovery time. Your dog will have restrictions on movement, diet, and exercise and you will likely have to return to the vet for check-ups. Your dog will be given pain medication, anti-inflammatories and antibiotics once released from surgery. If surgery is required, do not fret, just do your research and take all the precautions required to help your dog recover fully. “Painful Abdomen in Dogs.” PetMD, Accessed 19 Jan. 2018. www.petmd.com/dog/conditions/digestive/c_dg_acute_abdomen. “Dog Stomach Swelling: Causes and Treatment.” WebMD, Accessed 19 Jan. 2018. www.pets.webmd.com/dogs/my-dog-swollen-belly#1. “Painful Abdomen in Dogs – Symptoms, Causes, Diagnosis, Treatment, Recovery, Management, Cost.” WagWalking, 22 Nov. 2015, Accessed 19 Jan. 2018. www.wagwalking.com/condition/painful-abdomen. Davis, Jen. “Signs of Abdominal Cramping in Dogs | Cuteness.” Cuteness, 9 Feb. 2017, Accessed 19 Jan. 2018. www.cuteness.com/article/signs-abdominal-cramping-dogs. Wedderburn, Pete. “Why Do Dogs Get Upset Stomachs – Common Causes and Treatments.” The Telegraph, 19 Sept. 2017, Accessed 19 Jan. 2018. www.telegraph.co.uk/pets/news-features/do-dogs-get-upset-stomachs-common-causes-treatments/.